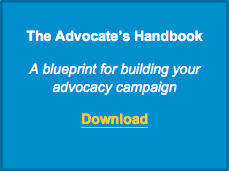 Advocacy is about shifting the balance of power. It’s about ordinary people coming together to influence powerful people and institutions, often in the service of those who are vulnerable, suffering or excluded. As an individual, you may not have the power or money to influence a decision maker. But, properly equipped, each of us has the ability to mobilize our community in such a way that will influence decision makers. The Freedom Commons exists to provide you with the connections, knowledge, tools and motivation you need to take action to end modern-day slavery and violent oppression and use your voice effectively for change. Meeting with your elected members of Congress is a powerful way to raise the profile of issues you care about and to effect change. But how do you get a meeting? Follow these 8 steps. You’ve scheduled a meeting with your members of Congress; now, use these resources to make the most of your time with them. Watch these video tutorials to learn about the four building-blocks of successful lobby meetings with your members of Congress. To have an effective conversation, you want your lobby meeting to be: accurate, brief and courteous. This is how to make sure you have productive meetings with your members of Congress. You’ve had your lobby meeting with your member of Congress, but don’t stop there: follow up and track your impact.